My wife and I laughed, of course. But my son believed that, when we invite Jesus into our lives, he somehow lives physically inside of us. Now that he’s twenty-five, I am sure his understanding has matured. When I look over my own faith journey, I can see how I have grown and matured in my relationship with God and deepened my understanding of his Word. I attribute many things to that growth, one of which is Sunday school. I remember teachers who faithfully taught me every Sunday about God and his love for me. That is why, as the editor of the Faith Connections curriculum, I believe strongly in what I do and in the materials I am responsible for helping create. This spring, we are introducing a new format for Faith Connections. We are still committed to a strong biblical and theological foundation and to providing a relevant way for people to encounter God’s Word: read it, understand it, discuss it, and discover how it applies to and affects their lives. 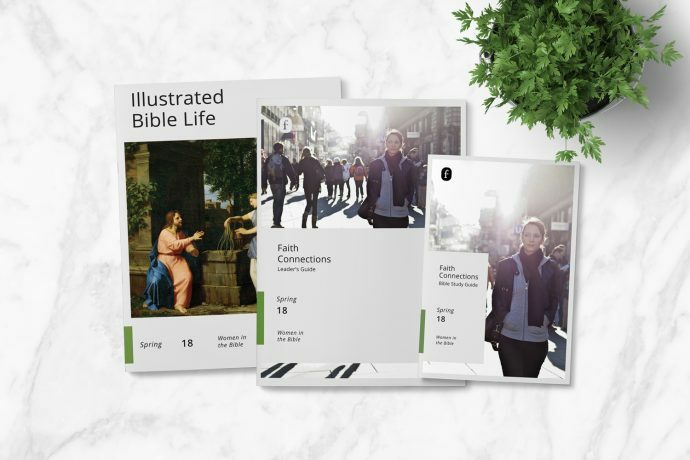 However, this new design will help facilitators feel even more confident leading and teaching the Faith Connections lessons, digging deeper into God’s Word, and building a strong faith community. Our purpose is always to help people grow closer to God and each other as they study his Word. We desire that, through our resources, people will understand the how and why of being the hands and feet of Christ in their world. Looking back over my life, I can see how my faith has grown since I was a child. This growth was not by accident, which is why we create the adult curriculum to help people be intentional about their faith journeys. Each passage selected, theme chosen, writer used, and question asked is done with the goal of helping people grow closer to God. As not only the editor but also one who uses the adult curriculum, I am excited about the future. Faith Connections is created to foster conversation and exploration, inspiring people to move from biblical literacy to biblical intimacy. My prayer is that, each week, through this resource, people will grow in their faith as they connect to the empowering and transformative truth of God’s great story. I’m so excited about this new curriculum for our adult class. It was a joy to contribute to the work and I am very hopeful about the effectiveness of this new format. I, too have been raised on the solid foundation of our church’s curriculum. I also have taught many leveels. As an educator, I appreciate its scope and sequence. Knowing that all Faith Points will be taught throughout the Faith Curriculum. Excited for March to get here. Looking forward to seeing what you have done with these materials! I am excited to share this new curriculum to our church body! Our church loves the quarterly during Sunday school and I know they will love this new format just as much! I have taught adults for the past 10 years and this new publication looks awsome! The sample in the new quarterly looks much simpler to teach ! We are a new start church with a new small group that would benefit greatly from these resources. Congratulations Rusty! You are the winner of the free year of Faith Connections curriculum for adults. We will be contacting you within the next week to get everything set up. We are so excited to hear about your new start church and how much this curriculum with benefit your group! I was praying for a ministry where I could learn the Word and share it yet I did not feel equipped. As a nurse, I learned thru studying and application. The Good Lord placed a desire in my heart that the best way to learn the Word is like I learned nursing. To read, research and application. The Sunday school curriculum offers the structure I need it to promotes self/ student participation. I’m excited to see this in print! I am glad to hear that women in the Bible is one of the new courses. I was in my late 40’s before I heard about Deborah. I have never yet studied her in a Bible study. She is a very impressive leader. We are a church who is beginning to reach our community. We have new Christians who are wanting to learn more and more about thier savior. They are thirsty for His Word. This is exciting to hear about what is taking place in the life of your church! I’m interested to see the changes! Really looking forward to the new curriculum. This is just what we need…. thankyou. I teach a Bible study at a retirement apartment complex and this would be great to use. This is awesome! Looking forward to it. We have a small new start church in Georgetown,SC. Great way to kick off an updated resource! Looking forward to checking it out. Looking forward to trying the new material. I’m ready for a new curriculum. Excited! SOOO excited to see this new curriculum coming out. It is fresh and what we have been needing for a long time! I hope that curriculum remains affordable and available in the future. We’re glad to hear you are excited about the changes and updates to Faith Connections! Thrilled to see NPH begin this new chapter. The curriculum seems more modern and relevant. This is going to be neat to be a part of. Thanks for your support Joseph and thanks for joining us in this new chapter. Thank you for the new look and work that has went into this project. Maybe the new look will encourage more people to read the lesson in preparation for class. I’m excited about the curriculum! Looking with great anticipation to the updated new curriculum to enhance our disciple making practices..
I’m certain there are a multitude of small churches that would be totally blessed by this, and we are one of them! Oh nifty! I would love to get my hands on the Illustrated Bible Life! Looking forward to an updated format! I’m glad for fresh curriculum, and the reassurance that Jesus likes pizza! I’m excited for this new look and approach! Thank you all so much for all you do to assist the local church in sharing the Word with our communities of faith. I am in transition to a new assignment and would like to launch this resource. We are liking the new products we’re seeing coming out of The Foundry! We are glad to hear it. Thanks for the feedback! Our church would greatly benefit from a free year of curriculum from The Foundry. We would like to continue using the Foundry products for our classes, but like many churches are having trouble affording curriculum on a quarterly basis. A free year of the new curriculum would give us an opportunity to try it out and budget for future curriculum purchases. This would be fantastic! We have new classroom space opening up in March and would love to kick off our new classes with this series! How exciting! Would love this for our church! Our congregation is learning about our holiness heritage—some for the first time. We would be blessed by this curriculum and for the financial blessing of this potential gift! I was looking at the info about the new format at GA and it seems very exciting. I am part of a new SS that is growing and we are trying to be very intentional about growing our faith. I love that that is something that you mention. Thank you for a fresh approach! This pastor is excited to see what the new curriculum holds for a very small church of mostly “golden-agers”! looking forward to seeing the new format!! Interested to see what is new and interesting about the Curriculum. Saludos para todos desde Lima, Perú. Me parece realmente una gran bendición que nuestra Casa Nazarena de publicaciones se renueve y estoy seguro que pronto esa bendición se extenderá a Sudamérica y todo el mundo. Bendiciones!! Excited about the new look and the subject that it is covering! I am new to the publications and all that is available through the foundry. I have just started in the role of overseer of adult ministries and I am confident that with your help, I will be able to set up a curricula that will allow our congregation to grow. Thanks for the chance to win. Looking forward to seeing the new content. I’m excited to see the changes in the new curriculum. As Sunday School Director of our rural Trenton, MO church, we have always used the Adult curriculum. We are excited for the new look & literature of The Foundary. As an increasingly older congregation, our pupils enjoy their weekly SS literature & daily devotion. With the free literature, we would be able supply other areas of our Sunday School like our childrens & youth depts. I’m looking forward to holding the new curriculum in March! I so much appreciate the solid Biblical teaching of our church’s materials.. Looking forward to the new curriculumn! The new look, feel, and layout is better and more engaging. Well done on the revision. We’re happy to hear you are looking forward to the new changes! We enjoy using the Nazarene curriculum and are anticipating seeing the new look – we know the lessons will be solidly grounded in God’s Word! Looking forward to this new content and resources! I have young adults coming that really are just beginning their journey. I am anxious to see where God is going to take us. Starting in September 2018, we will also be providing new young adult curriculum. Stay tuned for more information coming soon! We have a small Nazarene church teaching Native American families. The curriculum is so good but sometimes we can not afford the subscription but we managed to order every quarter. Thank you for a job well done in Holiness teaching. Faith Connections is the exact Sunday curriculum for our small church. I hope that the format does not change; my older Sunday School students really like the way the Scripture is printed in bold black letters. We using the curriculum and would love to see it expand. Thank God for wonderful lesson writers and for those who continue to bring the Bible to life through the Nazarene curriculum. Can’t imagine Sunday mornings without this curriculum! I am the new Pastor of a small church with a big history. In the last four months we have gone from only worshiping on Sunday and Youth on Wednesday evening to having a Wednesday night prayer meeting, Sunday School, and a Women’s Bible Study. We have taken in four new members by a profession of faith. It would be a blessing to have these materials as we grow in our knowledge and faith in Jesus. It’s great to hear the incredible things happening at your church! Thanks for sharing! You guys have done an amazing job. Showing what perseverance, trust, and faith look like thank you. Excited to see new ideas and new structures to discipling our people! Looking forward to the new. We use the curriculum as a comprehensive congregational discipleship plan, and I can’t wait to see how they connect with the new format. Looking Forward to the new, exciting materials in which to challenge our Adult Sunday School class ! I’m excited to see what God is going to do with this forward progress at The Foundry!! I am excited about the new curriculum that ‘The Foundry’ is publishing. So excited about the new name, look, and material. Great to see the advancements the Nazarene Denomination is making in reaching others to the Good News of Jesus Christ. This looks so Good! We are sold on the material from the Foundry. We use the curriculum now and have for many years in our class. Looking forward to seeing the new material! I will be excited to learn more of God’s word about women. My Sunday School class has grown within this last year. Am excited about that. Enjoyed using your curriculum before and interested to see the changes!